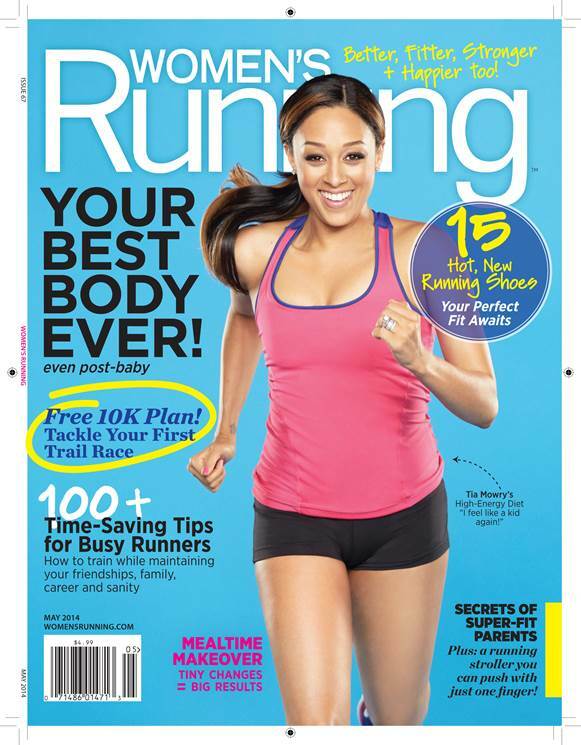 Available on newsstands now, former 90’s sister and current star of “Instant Mom” on Nick at Nite, Tia Mowry fronts the May 2014 issue of Women’s Running magazine. The 35-year-old mom to son Cree dishes on swapping fried food for quinoa, being diagnosed with endometriosis, about soup for breakfast, getting back into a routine post giving birth, saying goodbye to sugar, and why running is her go to workout. · On Miso soup at breakfast: “Miso soup with brown-rice miso, seaweed, tofu and carrots is a favorite. I’m a huge fan of soups in the morning,” said the actress who sites the Japanese who believe hot soup in the morning is a great way to prepare the digestive system for a meal. Behind the scenes, Mowry danced along to her favorite Pandora pump up channel: Today’s Hit Hop & Pop Hits, played around on a red mini tricycle and scoured the wardrobe racks full of sports bras, tops and tights to find the perfect looks.